This volume contains a variety of texts by or attributed to St. Augustine (354-430), Alexander Nequam (1157-1217), and others. 14th-century flyleaf inscriptions show that it was owned in the Middle Ages by the Gilbertine Priory at Sempringham, the foundation house of the Gilbertine order, founded by St. Gilbert in 1130. This is the first page of Augustine's 'Retractions', written late in his life, in which he listed corrections and amendments to his earlier writings. Space has been left at the top of the first column for a rubric, and a note to guide the rubricator still survives in the top left corner of the page. 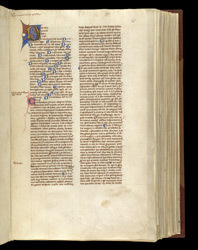 The initials and paragraph marks are blue, with red flourishing, a typical feature of English 14th-century manuscripts.